Mmmmmmmm potage. One of my favorite cold, rainy night dinners. Its basically a creamy soup made by simmering veggies (and sometimes meat) together until they break down enough to puree' them together in a blender. Brian helped me tonight...he's kinda become our dedicated potage chef. 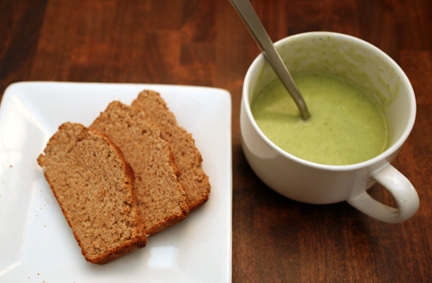 He used and slightly modified a recipe from one of our soup cookbooks, Soup: A Way of Life by Barbara Kafka. It turned out perfectly. In a medium saucepan, melt the butter over medium heat. Stir in the onion and cook, stirring occasionally, for 5 to 7 minutes, until wilted and translucent. Stir in the potatoes and stock. Bring to a boil. Lower the heat and simmer, uncovered, for 10 minutes. Stir in the broccoli. Cover. Simmer until the potatoes and broccoli are completely tender, about 10 more minutes. Strain the soup and reserve the liquid. 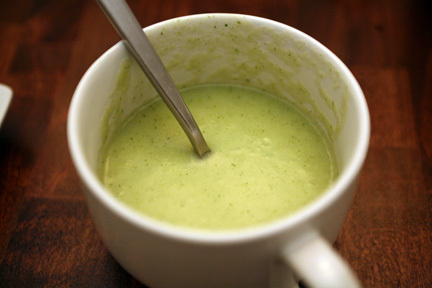 In a food processor or blender, puree' the vegetables with a little of the reserved liquid. 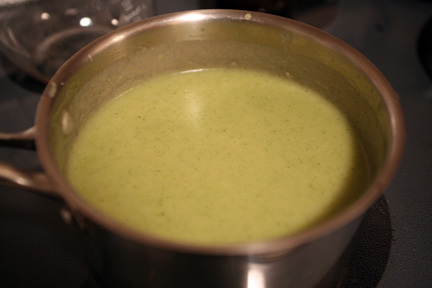 Whisk the puree' into the remaining liquid and return to the saucepan. Add salt + pepper and heat through. 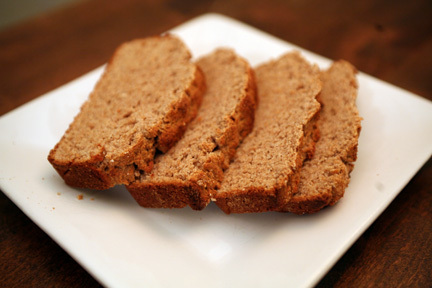 My task tonight was to try out the Oatmeal Whole Wheat Quick Bread recipe I found on Itzy's Kitchen. I was really impressed with how easy and fast this recipe was. And, it was really good! VERY filling. I made a couple of small modifications. Grind oatmeal in a blender. In a large bowl, combine oatmeal, flour and baking powder. In a separate bowl, dissolve honey in vegetable oil then stir in the milk. 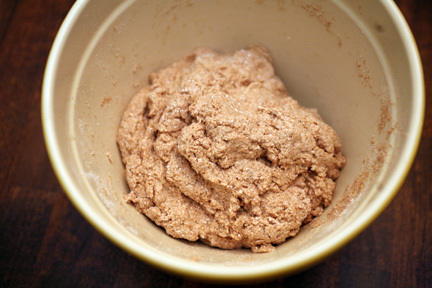 Combine both mixtures and stir until a soft dough is formed. Move dough into a greased loaf pan. Bake in preheated oven for about 25 minutes or until a toothpick comes out clean. If I had more honey, I would have used the 4 tbsp recommended in the Itzy's Kitchen recipe. My bread was really good, but it could have been a bit more sweet. Unfortunately I ran out after 3 tbsp so I just worked with what I had! I will definitely be making this recipe again. Dinner was sooooooo good. Exactly what I wanted at the end of this dreary day. The potage and bread are both really filling. I had about 1-1/2 cups of soup and 1-1/2 slices of the bread paired with a small glass of wine, and am now completely stuffed!!! A little backtrack to my afternoon snacking. Lunch only stuck with me for a couple of hours....it was just veggies. I realized when I was starving at 2:30 that I hadn't had much protein today, but sadly didn't have anything to supplement with at work. 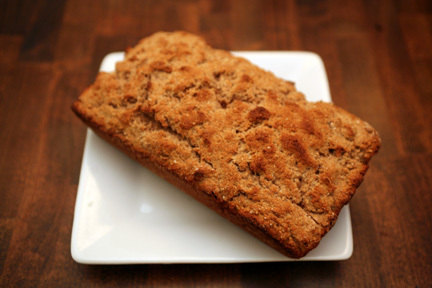 So, I had my apple and slice of banana apple bread for a snack with a cup of green tea, which held me over for another couple of hours. On Friday afternoons my office always gets a bottle of wine, cheese and crackers to celebrate the end of another week. Today we were also celebrating my big drawing submittal yesterday, which was nice. I had a small glass of wine, about a 1oz piece of really yummy white cheddar and a couple of water table crackers. No pictures, I still haven't gotten comfortable enough to clue my co-workers in to what I'm doing. I think that's best for now though. Tomorrow starts another week of training and blogging!!! I wasn't very good this week, I was so busy that my workouts and home cooking suffered. I hope to find a way to better balance things because the busy weeks will keep happening and if I want to get to my goal weight I need to stay on top of my exercise and good eats. I am now totally pooped out and ready for bed, so no BSI cooking tonight. I did spend about an hour working out my recipe though, so I'm all ready to prepare it tomorrow!